Star Trek Enterprise NCC-1701 Messenger Bag - Moar Stuff - You don't need it but you know you want it. Carry your stuff around with some NCC-1701 styling! Awesomely detailed messenger bag looks just like the starship Enterprise. A must-have for Star Trek fans! This Star Trek Enterprise NCC-1701 Messenger Bag features construction and decoration inspired by the original Enterprise. There’s no bloody A, B, C, or D involved. The exterior offers a silver/blue 100% nylon shell to resemble the hull of the Enterprise. It also has two quick-release buckles on nylon staps which look like the warp nacelles and Bussard collectors. Under the flap you’ll find a pouch, a zippered pocket, and a see-thru ID slot with thumb assist, all of which you can get to without even touching the main compartment, which is a roomy 18″ x 10″ x 5″ for all the rest of your stuff. There’s also a padded 17″ x 10″, interior pocket designed to keep your laptop or tablet safe and secure. Even if you’re under attack by a hostile Klingon Messenger Bag. The rest of the interior features a blue Star-Trek-themed lining and a little bit padding all around, so you can safely keep your tricorder or Bluetooth Communicator in here without worrying about busting it. I wouldn’t carry a phaser, though. The TSA gets a little touchy about those things, even if they’re set on stun. There’s also a top carrying handle and adjustable, padded cross-body shoulder strap that provides up to 23 inches of extra slack. 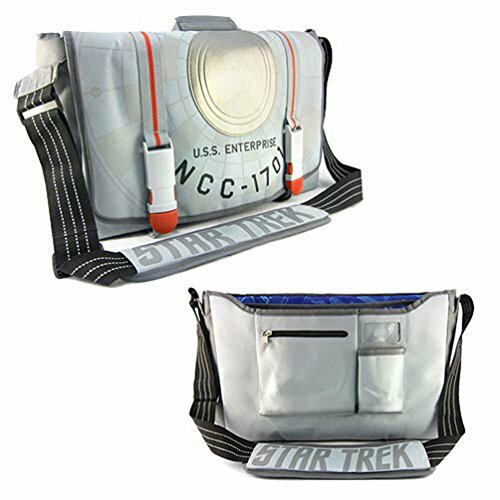 This awesome messenger bag is a must-have for Star Trek fans! Materials: 100% nylon outer and inner, PE foam inner padding, PU applique ship hull detail. Care Instructions: Spot clean with a damp cloth and mild detergent. Air dry only. Adjustable, padded cross-body shoulder strap (10″-23″ drop). Under flap see-thru ID slot + zippered pocket + pouch. Imported. Probably from Ferenginar. This looks like something they would make to prey upon your desire for cool Start Trek stuff. Well, it’s working.